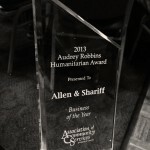 Allen & Shariff was presented the 2013 Audrey Robbins “Business of the Year” Humanitarian Award from the Howard County Association of Community Services (ACS). ACS honored humanitarian stars of Howard County at its 38th annual Audrey Robbins Luncheon on May 3, as the organization also celebrates its 50 years of service connecting the Howard County community. These awards not only recognize the achievements of those honored, but offer public recognition for the organizations and causes to which our honorees devote their time and energy. 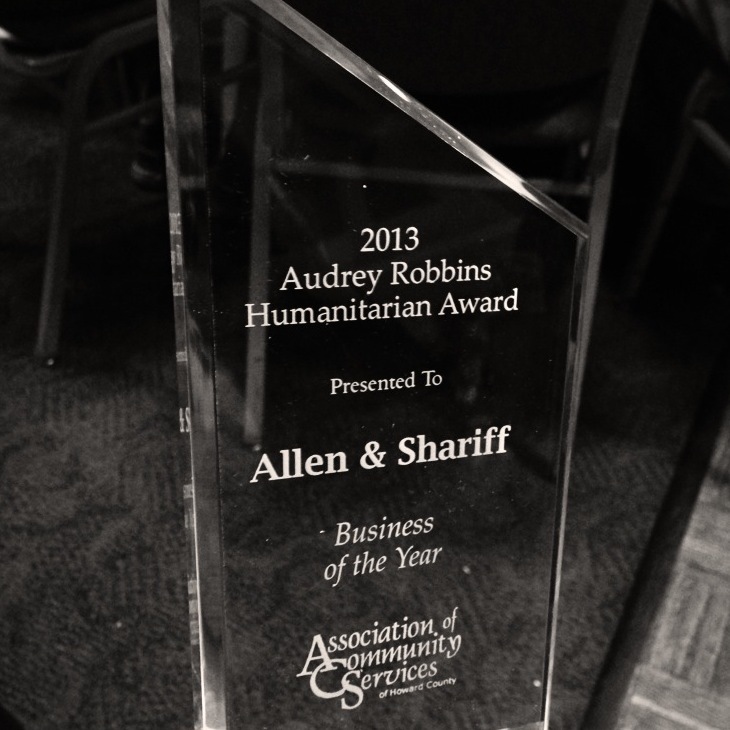 Individuals and teams who have provided services that enhance and enrich the lives of county residents by going above and beyond all expectations were recognized as 2013 Audrey Robbins Humanitarian Award Winners. This year’s recipients are as follows. About the Association of Community Services (ACS) – ACS is a dynamic network of Howard County human services providers and advocates focused on serving Howard County families and individuals. ACS is a membership organization supported by volunteers complementing a small staff.